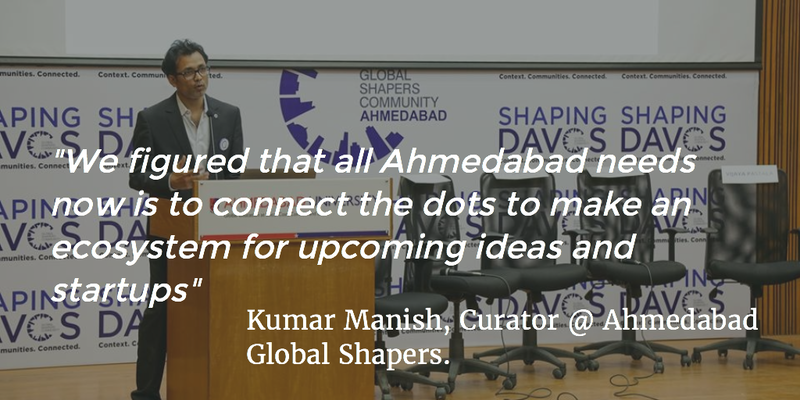 Ahmedabad: City’s one of the most active entrepreneurs community, Ahmedabad Global Shapers (an initiative of World Economic Forum) hosted Shaping Davos on January 20, 2016. Ahmedabad was one of the 20 cities to join live discussions from the conference at Davos, participating in conversations revolving around 10 key global issues. Ahmedabad is one of the few cities from India which is rapidly gaining popularity among upcoming startups, thanks to Government initiatives and the existing industrial ecosystem. 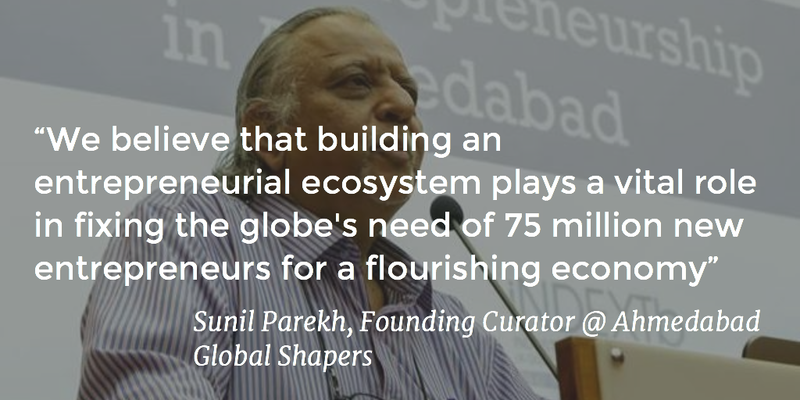 Discussions revolved around the theme ‘Creating 75 million entrepreneur, is it possible? Mr. Parekh also instated the need of cultivating an entrepreneurial mind-set at an early age and redefining risk in career progression for young people . Shaping Davos discussion in Ahmedabad was graced by dignitaries like Mr. Nagarajan, IAS – DDO, Sabarkantha, Mr. Shailendra Jaiswal, deputy Director Genera – National Academy of Indian Railway, Mumbai based Vijaya Pastala, founder and CEO of Under The Mango Tree and Neeraj Sonalkar, research associate, centre for design research, Standford University, Major General Anukul Chandra (retired), a defence industry expert and representatives from Government of Gujarat. Participants brainstormed over ideas that could build a fertile ecosystem for entrepreneurs in Ahmedabad as well as Gujarat. “We heard some interesting ideas that usually newer entrepreneurs do not think about, like setting up enterprises that can solve some recurring problems in Defence and Railways, which also is a brilliant potential market”, said Deep Patel, one of the participants and founder of Interestship. Retired Major General Anukul Chandra threw light on sectors in Defence Industry where startups can operate in and helped youngsters with various queries including where-to-go & who-to-reach. On the other hand, Ms. Pastala, talked about venturing in social sector. “Think of this as a business, work on making it a social enterprise and not an NGO for a sustainable, long-term impact”, she said. Mr. Shailendra Jaiswal who represented Indian Railways shared the need of various app-based solutions to make the railways function more efficiently. “Food & Beverages is a lucrative business in Indian railways followed by cleanliness and customer service. We are more than happy to welcome young entrepreneurs who can create solutions to these problems”, he said. The event hosted over 150 participants from various entrepreneurial segments. Key-deliverables from the event were shared through live webcast at Davos by Ms. Monica Yadav, one of the shapers with Ahmedabad Global Shaper Community and Mr. Nagarajan. AGS also represented the reports from their survey on entrepreneurs in Ahmedabad at the event. “These findings will be base to our next steps in taking the Ahmedabad entrepreneurial ecosystem to new level”, said Sneh Bhavsar, vice-curator at Ahmedabad Global Shapers.